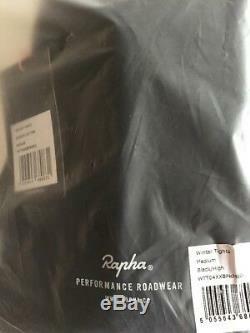 Brand new genuine Rapha CLASSIC WINTER TIGHTS in black/hi-viz pink size medium. Complete with bag & tags. 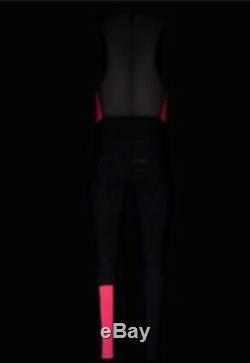 Thermoroubaix lined cycling tights for cold weather. Please note these bibs do not come with a pad. Designed for winter riding, these durable tights offer maximum comfort and insulation when the temperature drops. Raphas Classic Winter Tights are an essential piece of clothing for cold winter cycling. They are made from durable Italian Thermoroubaix fabric and have a brushed fleece inner throughout for maximum insulation. The tights are designed to be worn over your favourite bib shorts so there is no pad. The tights are shaped to provide an ergonomic fit and additional muscle support. Other features include a mesh panel in the back of the tights to help regulate body temperature and a fully-lined zip to allow you to answer calls of nature quickly and easily. The tights are finished with flatlock stitching to prevent chafing. The left leg has a contrast stripe with a printed Rapha logo and there is an additional'Wheelsucker' logo on the seat of the tights. I can honestly put my hand in the air and say that i have never worn a more comfortable pair of cycling tights. Lightweight mesh back for breathability. Thermolite fleece lining for warmth. No padded seat insert means they can be worn over your favourite bib shorts. Main fabric: 45% nylon, 42% polyester, 13% Elastane. Bib: 77% nylon, 23% Elastane. Seat panel: 52% nylon, 32% polyester, 16% Elastane. The item "Rapha Classic Winter Tights Black/Hi-Viz Pink BNWT Size M" is in sale since Tuesday, January 15, 2019. This item is in the category "Sporting Goods\Cycling\Cycling Clothing\Tights & Trousers". The seller is "wolves482008" and is located in Mansfield. This item can be shipped worldwide.